Born in Japan, Jun Kaneko has spent his adult life in the United States, a duality he merges in his work. While Artist-in-Residence at Cranbrook Academy of Art, he made huge eight-foot-tall monoliths, smaller sculptures of eccentric form, and plates that were sculptures on the wall rather than plaques or pottery. His work explores issues such as surface painting and physical density, pattern and abstract expression, repetition and disintegration. The vertical orientation of this plate confines the pattern of dots more tightly than a horizontal format would, introducing the tension of the upright. 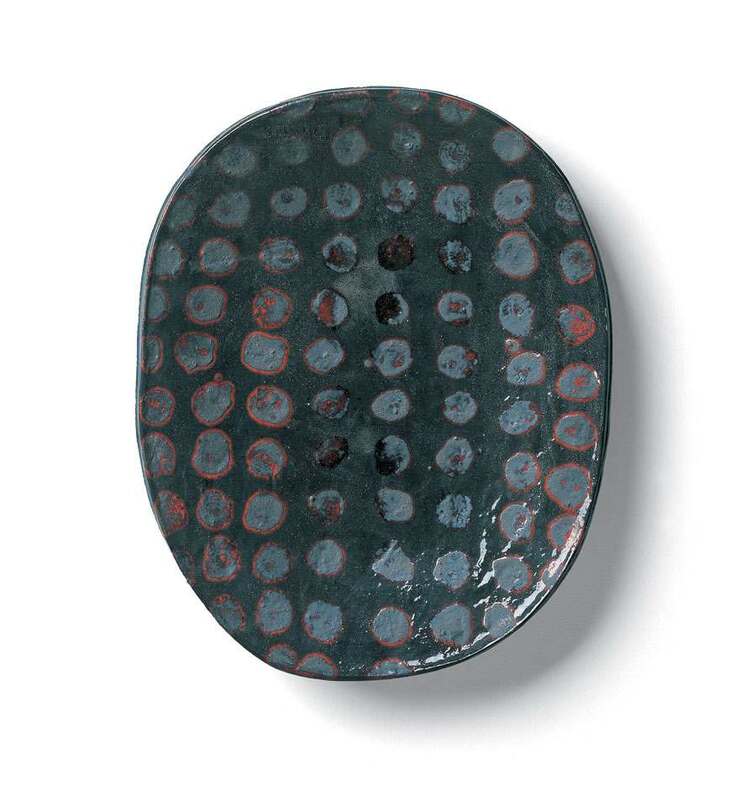 The stoneware body is stained black, then dotted with red glaze circles covered in dark circles, the red making a halo around the shiny darks. Chance determines their exact form, while their regular patterned order is the opposite. The polka dots continue off the edge of the plate indicating they are part of a modular system, conceptually endless in some of the rows. The balancing of opposites is key to the energy of a Kaneko sculpture.